When Andy Hulcy’s grandfather died, the job of maintaining the family’s lakefront property was passed on to Hulcy and his father, Deck. This included teaching themselves how to operate and maintain the dual-pump system Hulcy’s grandfather had engineered to bring water up from the lake to irrigate the property, which was situated on a small cliff. Learning the ins and outs of the homemade system was no easy task, but Hulcy put in the time and effort it took to figure it out, and he ultimately discovered a new career path. The thoughtful approach Hulcy used to figure out his grandfather’s irrigation system has stayed with him throughout his career. Andy’s Sprinkler, Drainage & Lighting was founded in 1987 as a part-time endeavor by Hulcy and his father who were both looking to leave the corporate world. They began by specializing in major irrigation system installations, as well as repairs and maintenance services, and became a full-time operation in 1993. Over time, Lester says the market for older homes needing an irrigation system naturally declined due to irrigation companies like Andy’s retrofitting sprinkler systems for those homes. He adds that beginning around 1990, it became standard for new homes built in Texas to come equipped with sprinkler systems, and it was difficult for the company to compete with builders’ margins. 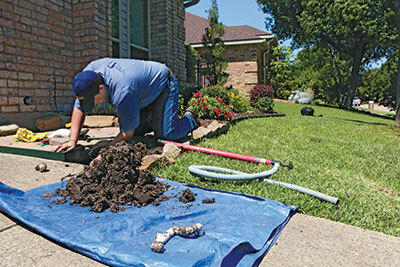 So about 10 years ago, the company began to move away from installations to focus on system repairs and maintenance. Lester says the company occasionally does a new installation on a case-by-case basis. Lester says Andy’s Sprinkler, Drainage & Lighting is first and foremost an irrigation company, but the firm has methodically added services that fit into its portfolio. In the early 1990s, Hulcy learned about drainage at an irrigation conference, and he believed the service was a natural complement to irrigation. He began offering the service in 1995. The company also added low-voltage lighting services in the late 1990s to help fill the downtime of the colder winter months. Today, Andy’s Sprinkler, Drainage & Lighting is a $15 million company that provides 60 percent irrigation system repairs and maintenance, 30 percent drainage and 10 percent lighting services to a 70 percent residential, 30 percent commercial clientele. Andy’s Sprinkler, Drainage & Lighting is also mindful when it comes to its hiring practices. The company recruits from the college of Agriculture and Life Sciences at Texas A&M University and the Agriculture Sciences College at Texas Tech University. Students majoring in business and other degrees from the University of North Texas are also part of Hulcy’s team. All the company’s service technicians hold either a Texas irrigator’s license or an irrigation technician’s license and are required to receive ongoing education and training. The company has a robust internship program, and Lester says at least 15 to 20 former interns have joined the company full time and are now in leadership roles. Despite the company’s focused approach to hiring, Lester says the seasonal nature of the irrigation business makes staffing an ongoing challenge. For this reason, the company has relied heavily on the H-2B guest-worker program for the past 10 years. The temporary workers come from Mexico and learn the business, return home for the holidays and are back to kick off the new season in January. The company is an active supporter of H-2B—in fact, Lester was recently in Washington, D.C., for a fly-in event to help “influence the powers that be” to continue to support the program. A few years ago, Hulcy began contemplating the idea of taking his brand to the national level in the form of franchises. The company went through the proper Federal Trade Commission protocols and legalities and officially began marketing its franchise operations in 2016. The first location opened this year in Charleston, S.C., and Lester says the company has potential opportunities percolating in Georgia, Florida, Colorado and Texas. Going forward, Lester says the company will focus on perfecting and growing its franchise process, while continuing to improve internal systems.